Bird flu – scourge of the skies! Bird flu – it just may be the end of us all! Or will it? October 2005 marked the beginning of Hong Kong’s newest emergency service – the Bird Squad. Dedicated to the prevention of bird flu, the squad’s main duties are collecting and testing dead birds around the territory. 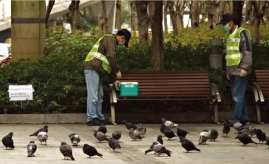 Spread over four centers throughout Hong Kong, they are our first line of defense against the dreaded H5N1 pandemic. Our journey begins at the Animal Management Center in Pok Fu Lam. It’s the home of the Hong Kong Island bird disposal team. Bravely, it is here that we step in and become part of the bird flu fight for one short, memorable morning.